Dancing Classrooms (5th grade) • This perennial favorite teaches the art of ballroom dance, culminating in a performance for parents and peers. Our dancers have been featured in the film Mad Hot Ballroom and participated in citywide competitions. Dancing Classrooms offers a 10-week social development program utilizing ballroom dancing as a vehicle to change the lives of not only the children who participate in the program but also the lives of the teachers and parents who support these children. With core values of respect, compassion and creating a safe space, Dancing Classrooms Teaching Artists create environments and model behaviors that offer children a place to thrive during their school day. The program helps develop important skills and behaviors in students, including civility, respect, teamwork, and self-discipline. Guggenheim Learning Through Art (3rd grade) • New York's famed Guggenheim Museum has created an innovative program focusing on the intersection of art and science. LTA cultivates student creativity by designing sustained, process-oriented art projects that support learning across the curriculum. During the 20-week in-school residency, our students examine, discuss, and create works of art. Past years have featured Da Vinci inspired inventions, the science of color, and the artistic rendering of kinetic and mechanical energy. Children make multiple visits to the museum which offers new insights into art and challenges them to think critically about art and ideas. 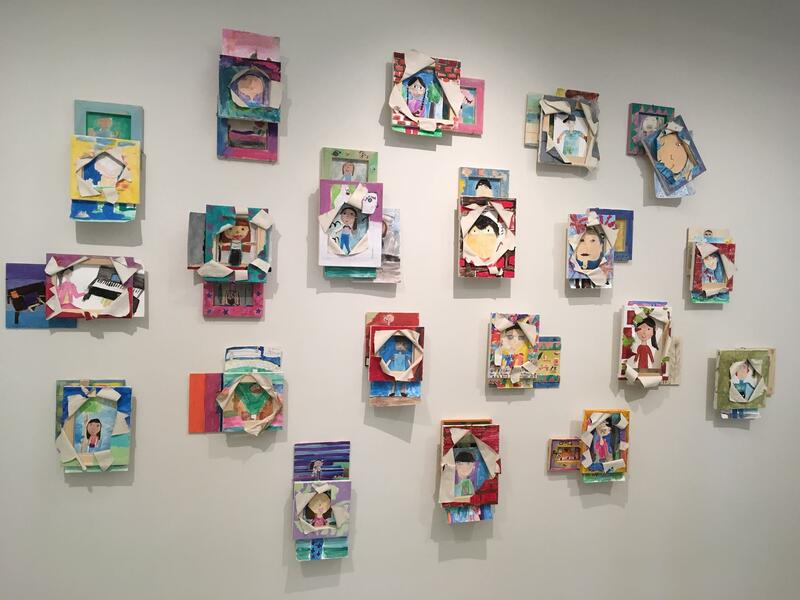 Each residency year culminates in an in-school exhibition featuring the work of every child in the grade, and selected student works are exhibited in the annual A Year with Children exhibition held at the Guggenheim Museum. Music Theory and Performance with Betina Hershey (full: K-1st grade) (mini: 3rd grade) • Local musician, teacher, and composer Betina Hershey brings in innovative methods of child music literacy with a great sense of fun to our kindergarten and 1st graders, while giving the 3rd grade a folk song residency that will end with a Folk Sing-Along Assembly. The early childhood program (K-1) introduces important musical concepts that continue as the children rise to the next grade maintaining the music literacy level already achieved. This program is based on the Kodaly music method with the idea that every single human being can sing on pitch, feel the beat, keep rhythm, learn to sight sing, notate music, and understand music as a language. Making Books Sing with Betina Hershey (4th grade) • This residency will focus on turning a book in to a musical, learning musical theater song structure, and writing songs for the scenes that their classroom teacher will guide them in writing. They will continue learning solfege, rounds, and songs from musicals. Path to Rhythm: Group Drumming Program (2nd grade) • Teaching Artist and founder Adam Issadore will bring in authentic African hand drums called Djembes and will lead and teach the 2nd grade classes a five-week group drumming residency. The classes will be interactive group drumming where all students and teachers will participate and be fully engaged and inspired to learn and play using drums and rhythm. They will be exposed to music making of other cultures that will create a sense of community and connection. By the end of the fifth session, students will be able to play rhythms in unison and will demonstrate what they learned in an open class. Puppetry (2nd grade) • 2nd graders learn the art of puppetry, from creation to performance under the tutelage of a Marquis Studios teaching artist. Each student creates his or her own papier-mâché puppet to use in an original performance. The student creates distinct, recognizable characters that come alive through costumes, props, shape of features and expressions. The class learns the various skills of puppetry art, which include design, sketching, sculpture and painting. Once the puppets are made, the class writes a script and begins the puppet show production—staging, scenery design, music and sound effects. In the rehearsal process, the students are encouraged to build vocal projection and theater skills. Self-confidence and free expression are enhanced through this process. Queens Museum (4th-5th grade) • The Queens Museum is a vital local institution, occupying The New York State Building featured in the 1964 World's Fair. Our partnership with QM sees every fourth and fifth grader engaging with contemporary artists in the classroom and at the museum, using the museum's permanent and temporary exhibitions as inspiration. 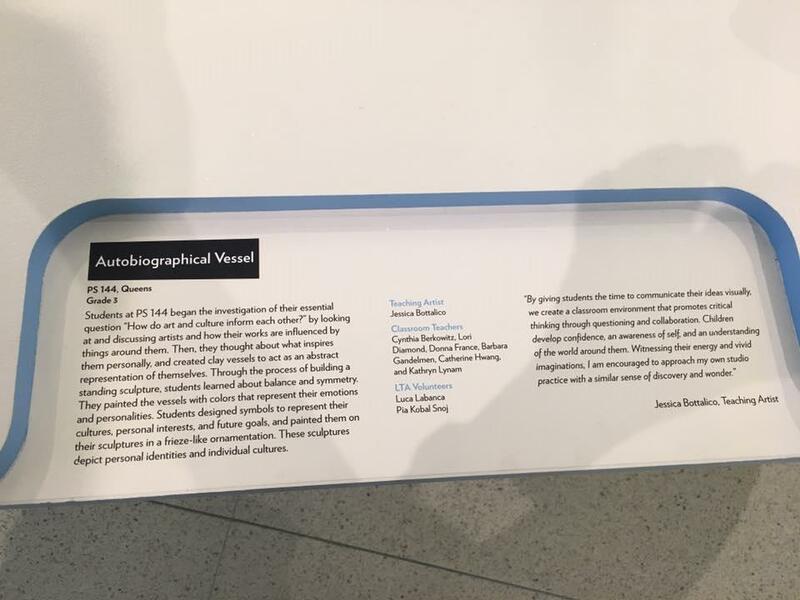 Previous work has included explorations of bridge engineering, interior and exterior architecture, sculpture, picture book illustration (with the opportunity to meet acclaimed children's author and illustrator Brian Selznick), Warholian exploration of pop art, and a study of physical modeling of the New York watershed, among other innovative projects. In addition to focusing on classical technical skills, the QM program inspires creativity in applied design as well as fine art. The QM partnership includes ArtsAccess programming especially geared toward children with varying abilities providing tools that may be used every day in the classroom. Our contribution to this program is partially matched by a grant from the New York State Council for the Arts. Bricks 4 Kidz (1st grade) • This is a hands-on class where the students build machines, buildings, vehicles and other structures out of LEGO bricks, using one-of-a-kind model plans designed by Bricks 4 Kidz. Each class begins with a teacher-led discussion related to the model of the day that will be built. Once the project is complete each class, student’s use the rest of their time to modify their model builds and collaborate with one another. Each week there will be a new project and while exploring principles of engineering, architecture, physics and more, students will develop problem solving and critical thinking skills. DNA Learning Center (5th grade) • This residency brings the excitement of molecular biology to P.S.144 in partnership with the educational arm of famed Cold Spring Harbor Laboratories, home of Dr. James Watson, the co-discoverer of DNA's double helix structure. The DNALC’s program of genetics laboratory experiences includes a variety of hands-on experiments to introduce students to the wonderful world of molecular biology. Mission Be (3rd grade) • Mission Be provides mindfulness-based social emotional learning to help children thrive academically and beyond. Mission Be offers an 8 Week Mindfulness Program with eight weekly lessons (each 30-45 min) taught by master’s level Mission Be trained staff or educators. The program is based on mindfulness practices designed to improve student learning and school climate, reduce stress, increase focus, improve empathy, emotional regulation, and emotional intelligence, increase resilience, and improve physical and emotional well-being. The Broadway Class - Beatles and Beyond (4th grade) • Former Broadway actress Leah Zepel along with her husband musical director Rob Preuss bring a unique music history class to P.S.144. The students will explore the history of pop music starting with the music of the Beatles-who their influences were, and how they changed the landscape of music to this day. The students will learn how the Beatles music influenced some of their favorite contemporary artist such as Ariana Grande, Taylor Swift, Maroon 5 and more. The residency will end with a choreographed Beatles themed show. The Broadway Class – Hamilton History Lesson (5th grade) • Former Broadway actress Leah Zepel along with her husband musical director Rob Preuss expand on what they taught the 5th grade for graduation two years ago. Now in a full 10-week residency, they will teach the 5th grade numbers from the award-winning musical that depicts this important part of American history that they studied a year ago as part of the 4th grade curriculum. The class will end with a choreographed performance. Common Kids Musical (1st grade) • Local teaching artists Kimbirdlee and Jonathan Fadner bring this new musical theatre residency to P.S.144. The class aims to cultivate the skills that not only apply to musical theatre and dramatic arts – singing, dancing and acting – but also hone valuable life skills that are proven to benefit children academically and socially. What is taught will help build confidence and self-awareness that will be useful in all aspects of life. The overall goal is to give the students a valuable and fun experience that also equips them for successful lives as creative people with unlimited potential. Together In Dance – ABCs of Creative Movement (Kindergarten) • This new residency is a partnership between P.S.144 and Together in Dance that is designed to provide high quality dance education to early learners, while providing teachers with skills and knowledge in order to integrate movement into their daily activities. Students will learn to deepen connections between arts learning and cognitive, social and personal development. They will be taught discipline and how to foster self-expression thereby developing communications skills – both verbally and kinesthetically. The classes will help students create strategies to work cooperatively and collaboratively while engaging them in the creative process of dance making. Architecture of the Neighborhood (2nd grade) • From the teaching artists of Marquis Studios that us brings P.S.144 puppetry, the second graders will have the opportunity to think about the buildings that make up their own community. What materials are they made of? What purpose do they serve? How and why were they designed that way? Students explore the history and social fabric of their neighborhoods through the eyes of an architect. They learn how to judge a buildings age based on its architectural style and features.